na ja, große Brüder altern eben in Würde. Edwin Torres was born on June 18, 1965 in New York. He is an original member of the spoken word collective Nuyorican Poets Cafe Live. Torres created a movement which he called 'Interactive Eclectrcism', which combines movement, audience participation, music and songs. He has also created the 'Poets Neurotica', where dancers and musicians performed alongside two to four poets. 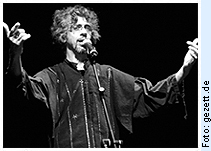 From 1993 to 1999 Torres was a member of 'Real Live Poetry', performing and conducting workshops across the US and overseas. Torres has represented New York in the 1992 National Poetry Slam. Besides performing at the Nuyorican Poets Cafe, Torres has performed at the Guggenheim Museum, Lincoln Center for the Performing Arts and the Museum of Modern Art, amongst others. Torres has received numerous poetry fellowships, f. e. from the New York Foundation for the Arts, The Foundation For Contemporary Performance Art, The Poetry Fund and The Lower Manhattan Cultural Council. His work has been published in a range of journals and anthologies. Additionally, Torres is the co-editor of the poetry journal/DVD Rattapallax.